Nearly forty years of conflict have deeply affected Afghanistan. Despite efforts to stabilise the country, the security situation continues to deteriorate. This is what led the United Nations (UN) to reclassify last year the country from one in post-conflict to one in active conflict. Whilst peace talks between the Government of Afghanistan and the main non-state armed group continue, the conflict between the different actors across the country has continued to intensify. Attacks on civilians and aid workers, including many grave violations of International Humanitarian Law, have increased, and 2018 is on track to be the deadliest year on record for civilians in Afghanistan. Between January and September 2018, the United Nations Assistance Mission in Afghanistan (UNAMA) has documented 8,050 civilian casualties including 2,798 deaths – the most deadly nine-months since 2014. Such attacks are more and more targeted directly at civilian populations and, in some cases, at specific minority groups; so far, they account for 45% of all civilian casualties in 2018. This deteriorating security crisis, combined with slow economic growth, has resulted in widespread poverty with around 55% of the population considered to be living below the national poverty line. This is a considerable decline, compared to 38.3% in 2012-2013, with an increase of 5 million people living in poverty. In rural areas, the poverty rate is even higher –with almost 60% of the rural population living in poverty. Economic access for these families to food and other essential items is increasingly reduced, which leads them to food insecurity, as two out of five people lack adequate amounts of nutritious items, proteins and micro-nutrients within their food consumption. Successive waves of violence have resulted in a large number of people having to flee. Last year, on average, 1,200 people were forced to flee their villages to safe havens, often urban centres, every day. In addition, an estimated 2 million people have returned to Afghanistan since 2015 – largely from the neighbouring countries of Pakistan and Iran, and including many who have attempted to seek asylum in Europe. At the Brussels Conference, on October 4-5, 2016, the international community committed to provide $15.2 billion until 2020 to support Afghanistan’s development needs. However, the expected positive impact of this investment continues to be undermined by a humanitarian crisis, continuing displacement and high-level of chronic and unmet needs. Such challenges are further compounded by insecurity (that both restricts humanitarians’ ability to reach populations in need and impedes populations’ access to assistance), physical constraints (such as distance to facilities or weather conditions), bureaucratic constraints and a lack of governance over the Internally Displaced Persons (IDP) situation. In Afghanistan, the aid system continues to lack effectiveness and fails to address the reality of needs and rights of the population. Action Against Hunger raised the alarm twice in the past decade by conducting case studies, and does it a third time today. Despite huge amounts of aid, the situation in Afghanistan keeps deteriorating. The aid is incoherent with the realities on the ground and there is in particular too great a distinction between humanitarian and developmental actions. 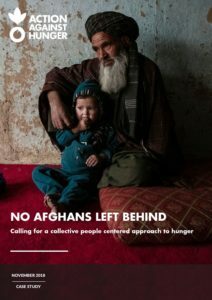 In order to break the cycle of conflict and hunger, it is urgent that all actors embrace an inclusive Nexus approach focused on the needs of the Afghan population whilst ensuring space for principled humanitarian action.